Has the bell now started tolling for secular politics in India? 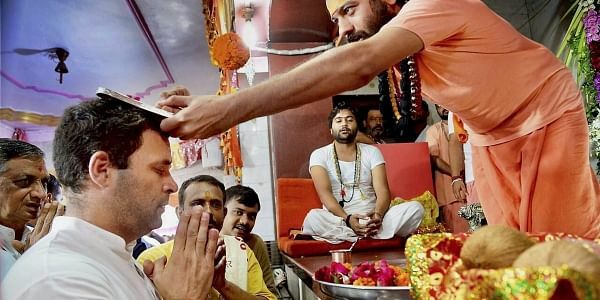 Congress vice-president Rahul Gandhi is on a temple tour ahead of the Gujarat elections and claims to be a Shiva bhakt. Akhilesh Yadav is gearing up to install a Krishna statue in Saifai. LUCKNOW: Congress vice-president Rahul Gandhi is on a temple tour ahead of the Gujarat elections and claims to be a Shiva bhakt. Samajwadi Party chief Akhilesh Yadav is gearing up to install a Krishna statue in his native village, Saifai, to counter Uttar Pradesh Chief Minister Yogi Adityanath’s plan for a grand Rama statue in Ayodhya. Has the ‘secular politics’ we have seen in India for decades hit a dead end? The Congress and the Samajwadi Party, which claim to be protectors of minority interests, now seldom talk about such issues. Although the Congress has practised the politics of ‘soft Hindutva’ in the past, it now has no qualms about doing it upfront. And SP mentor Mulayam Singh Yadav was once given the sobriquet of ‘Mullah Mulayam’. “The saffron sweep in two big elections – for the 2014 Lok Sabha and the 2017 UP Vidhan Sabha – seems to have forced them to change their alignment as far as mixing of politics and religion is concerned,” a prominent political scientist said. The political precipitation in favour of Hindutva can be traced to Yogi Adityanath’s anointment as CM and his hyperactive approach to promote UP as a religious destination. Resurrecting ‘Treta Yug’ in Ayodhya on Diwali and announcing a 100-ft statue of Lord Rama on the banks of river Saryu set the ball rolling. Then the UP CM chose Ayodhya to launch his civic poll campaign. “Ram ke bina koi kaam nahi hoga (No good work is possible without invoking Rama),” he remarked at his first public rally seeking votes for the Ayodhya-Faizabad mayor. Congress vice-president Rahul’s religious streak came to the fore when he was campaigning in Gujarat recently. “I am a Shiva bakht and I believe only in truth and nothing else,” he said. Similarly, SP chief Akhilesh is planning to install a 51-feet-tall statue of Krishna in Saifai. “Woh mere Bhagwan hain (He is my God),” Akhilesh has iterated. He plans to raise the “raudra swarup” of Krishna holding a chariot wheel in his hands as a weapon to take on his rivals. “None of the major political parties is talking about the Muslims. The days of soft and subtle Hindutva are gone,” said a political observer, adding that all parties were aggressively playing up the Hindutva card to woo Hindu voters. The parties have seen in the 2014 and 2017 elections that even a polarised 20% Muslims cannot see them through if the majority Hindu votes don’t get divided. It’s simple arithmetic. “Some years ago, there was hardly any political stalwart who would not be seen climbing the stairs of Jama Masjid. But the new crop of leaders has stopped the practice. Now the race is on to visit temples,” said a senior political analyst, JP Shukla. The way Akhilesh has thrown his hat into the ring to appropriate Hindu votes and to shed his pro-minority image seems to have hurt the Muslim support base. “Religion is being used as a tool to win elections. Their true colours are exposed,” said Maulana Yusuf Jayee, a senior Muslim cleric. Most political experts feel that resurrection of ‘Treta’ and ‘Dwapar’ is a new trend in Indian politics that was never there since Independence. Late Prime Minister Indira Gandhi visited many temples after losing the 1979 elections, but the visits were personal and not in her capacity as a political leader.